Earning $100,000 a year is something of a milestone in American society. Not many Americans manage it, but those who do stand a good chance of leading a financially secure life. They can take that robust income and sock away cash in a high-yield savings account and invest money with a financial advisor. Below, we look at IRS data to find the places with the most six-figure earners. Specifically, we take the number of tax returns with income greater than $100,000 and compare it to the total number of tax returns. Check out our data and methodology below to see where we got our data and how we put it together to create our final rankings. 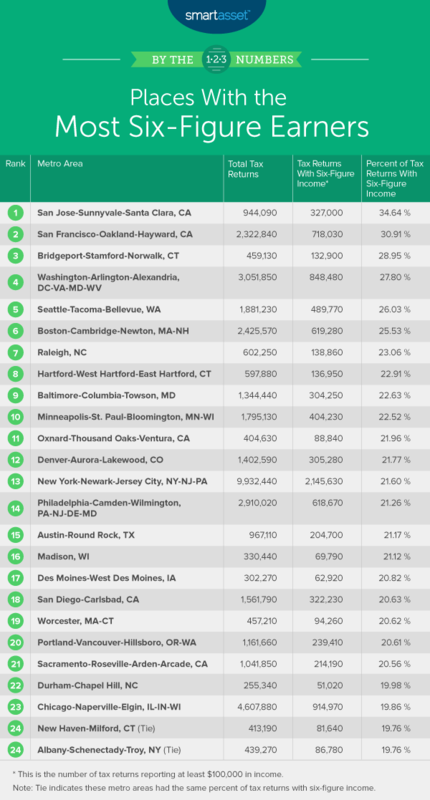 The money is on the coasts - Only one metro area in this top 10 - Minneapolis, Minnesota - is centrally located in the U.S. The other nine metro areas are located on either the East or West Coast. You have to spend money to make money - It is important to remember that earning six figures in San Jose, California is not the same as earning six figures somewhere more affordable. All the places that rank in this top 10 can be considered high-cost-of-living areas. For example, our cost of living calculator estimates that earning $100,000 in San Francisco is equivalent to earning $71,000 in Cheyenne, Wyoming. It is no surprise that residents in the San Jose-Sunnyvale-Santa Clara, California metro area earn a lot. Thanks in part to the booming tech scene, the average worker in San Jose earns more than $77,000 per year. That translates to nearly 35% of tax returns reporting incomes greater than $100,000. Not all is sunny for six-figure earners here, though: California is a high-tax state, and the San Jose metro area comes with a high cost of living. The San Francisco metro area takes second. In total there were 2,322,840 tax returns in this metro area. Of those, 718,030 reported earnings of $100,000 or more. There are just under 41,000 software application developers here, making it one of the most popular occupations in the area. In fact, there are nearly as many of these developers as waiters and waitresses. The average software application developer gets paid more than $141,000. Famously, though, San Francisco is expensive, and you may feel like you need to earn six-figures to make ends meet here. Just under 29% of tax returns in the Bridgeport, Connecticut metro area report at least $100,000 in income. That is the third-highest share in our study. More than 13% of tax returns report an income of more than $200,000. This metro area has 6.5 financial advisors per 1,000 jobs, one of the highest rates in the country. Financial advisors earn more than $100,000 on average. Plus, with so many in the city, local residents should be able to seek out the best advice to make the most out of their investments. The metro area around the nation’s capital comes in fourth. Nearly 850,000 tax returns reported income greater than $100,000. That makes it the metro area with the largest number of six-figure-earning tax returns in the top 10. But there were more than three million tax returns in the Washington, D.C. metro area. That means just 28% qualified as earning six figures. Up in fifth is Seattle. More than 26% of tax returns in this metro area reported incomes of at least $100,000. Fans of the TV show “Frasier” will also be delighted to know that his legacy lives on in the Emerald City. According to BLS data, psychiatrist is the highest-paying profession in the city, with an average income nearly topping $273,000. That said, shrinks aren't legion here. A wide-variety of high-earners is what makes the proportion of residents who bring in more than $100,000 so high. The six-figure-paying occupation with the most workers is software developer. The metro area of Massachusetts’ capital comes in sixth. Nearly 620,000 of the 2.4 million tax returns from this area report an income above $100,000. Of those 2.4 million, just under 9% report incomes above $200,000. The biopharmaceutical industry is especially important here. More than 6,200 residents are employed as either biochemists or biomedical engineers, two occupations that both pay around six figures, on average. Located within the Raleigh, North Carolina metro area is the Research Triangle Park, the largest research park in America. Jobs in the research park are well-paying for the most part, a fact that explains why there are so many six-figure earners here. In total, there were about 602,000 tax returns filed in this metro area, and just under 139,000 reported earning over six-figures. In percent terms, that means slightly more than 23% of tax returns report six-figure income. 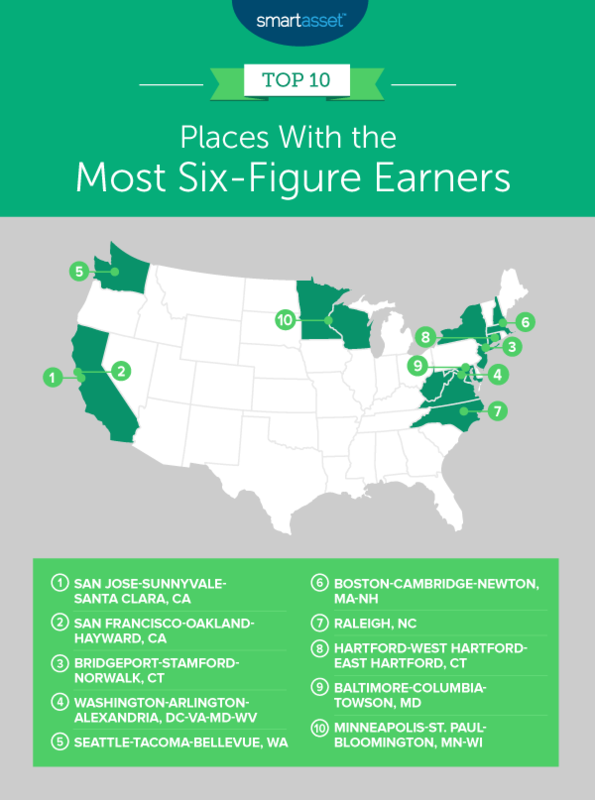 Residents in the Hartford metro area do well for themselves. IRS data shows that just under 101,000 tax returns report earning more than $100,000 and under $200,000. At the same time, an additional 36,000 tax returns report earning more than $200,000. In total, that means just under 23% of all tax returns have at least six-figure income. According to our analysis of IRS data, 22.63% of all tax returns in the Baltimore, Maryland metro area have an income above $100,000. One of the most common occupations for six-figure earners is systems software developer. There are nearly 8,000 systems software developers in the Baltimore metro area. On average they earn $117,240. This metro area straddling Minnesota and Wisconsin takes the 10th spot. There were nearly 1.8 million tax returns filed here, according to the latest IRS data. Of those, slightly more than 404,000 reported earning at least $100,000 per year. The Minneapolis metro area stands out as a place with a large chunk of their six-figure earners making less than $200,000. Nearly 17% of tax returns here report earnings between $100,000 and $200,000, while just under 6% report income above $200,000. Total tax returns. This is the total number of tax returns with income. Data comes from the IRS and is for 2016. Tax returns with an income of at least $100,000. Data comes from the IRS and is for 2016.To create our final rankings, we took the number of tax returns with an income of at least $100,000 and divided it by the total tax returns. This gave us the percent of returns with an income of six figures. We then ranked the metros from highest to lowest based on this percent. Create a budget - You don’t need to be a millionaire to feel like a million bucks. But what you do need is a budget you can stick to that gives you room to save money for retirement. A good way to set up a budget is to set it up by needs, wants and saving. We recommend the 50/30/20 rule, which stipulates you should spend 50% of your income on needs and 30% on wants while saving 20%. Find an advisor - Investing can be complicated but also worthwhile. It is almost impossible to set yourself up for retirement without having a detailed investment plan. If you are not sure how to invest your money or don’t have the time to do all the necessary research, why not invest with a financial advisor instead? A financial advisor can not only make sure your money is getting the best returns but also set you up to lower your long-term tax burden. To find an appropriate financial advisor, check out SmartAsset’s financial advisor matching tool. It will match you with up to three local financial advisors who fit your investing needs.